Some rodents, such as squirrels or hamsters, carry food in their cheek pouches, giving them a puffy appearance. That's not true of the guinea pig. If your pet's cheeks appear puffy or swollen, take him to the vet for diagnosis and treatment. Abscesses are pus-filled lumps resulting from infection. If your pet got bitten by a cage mate or suffered a puncture wound from a splinter or other object, an abscess could appear. 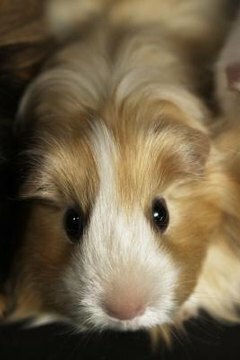 Those puffy cheeks might indicate an abscess in your guinea pig's mouth or jaw. The lump is tender, so touching it can cause your pet pain. Your cavy might also appear lethargic and stop eating. Your vet will lance and clean out the abscess and prescribe antibiotics for your pet. Since mouth abscesses are more difficult to treat, your guinea pig might have to stay at the vet for a few days until healing begins. Formally known as cervical lymphadenitis, "lumps" are abscesses forming in the guinea pig's lymph nodes along the neck and under the jaw. The latter can given the appearance of puffy cheeks. They differ from run-of-the mill abscesses as they specifically affect the lymph nodes, so infection can spread throughout the body more quickly. Besides the swellings, symptoms include head tilting, eye and ear infections and pneumonia as the bacteria spread. The usual bacteria involved in lumps, Streptococcus zooepidemicus, passes from infected guinea pigs through coughing and cuts and scrapes. Burst or lanced abscesses bring forth thick pus. In addition to antibiotic therapy, your vet might surgically remove the abscess rather than simply lancing and cleaning it. Your pet's teeth grow continuously throughout his life, so he requires constant access to grass or timothy hay so these fibers keep his teeth worn down. Malocclusion occurs when the teeth become misaligned because of uneven wear. Sharp points on the teeth can penetrate the inside of the mouth, causing swelling on the cheeks. Other symptoms include drooling, the reason the condition is often referred to as "slobbers." Because he's in pain, your pet might stop eating and lose weight. Your vet can trim the overgrown teeth, although severely affected teeth could require extraction. Although rare, it's possible that a lump on your guinea pig's cheek could be caused by a cyst or tumor. Benign or malignant tumors occur more often in senior guinea pigs. Your vet can perform a biopsy to determine the nature of the lump. Skin tumors can be surgically removed, as can cysts -- sacs filled with secretions -- although the latter might be harmless.